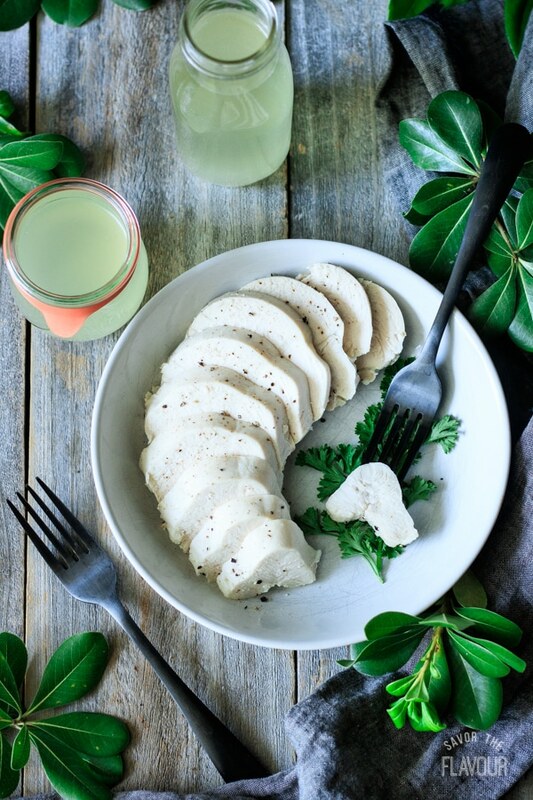 How to make poached chicken is an easy recipe to use for a healthy low carb dinner option, or when you need cooked chicken to use in salads, sandwiches, enchiladas, and pot pies. Your chicken will be silky, tender and flavorful. As a bonus, you’ll have homemade chicken broth to use for cooking rice. 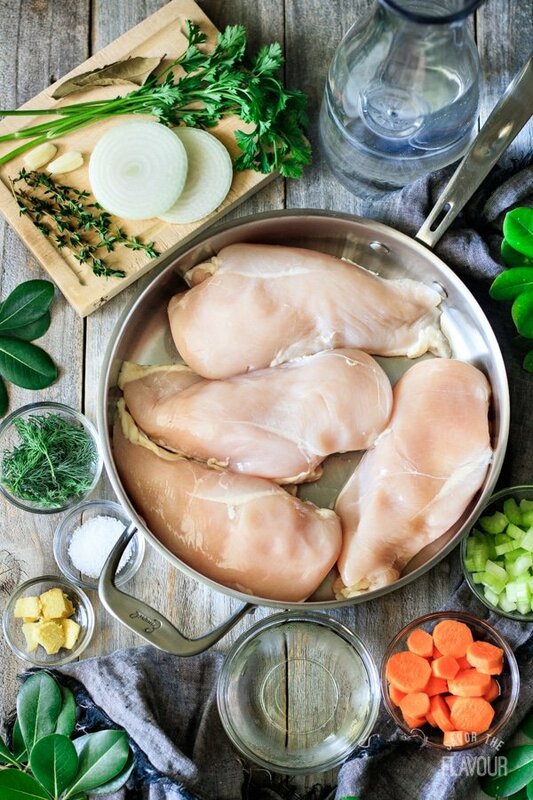 Are you looking for a healthier way to cook chicken? Forget the grill–use your skillet to poach it. It’s a cooking technique where the food is simmered in a liquid at a low heat (160-180F). 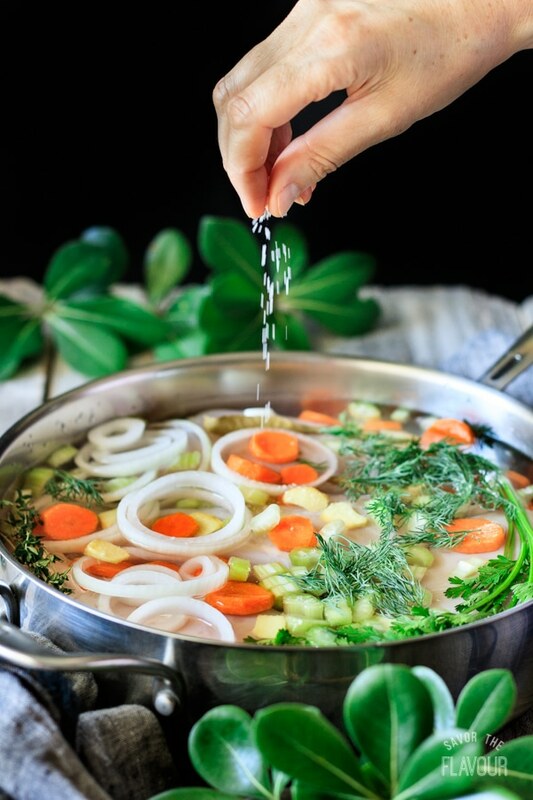 By using this cooking technique, very little moisture is lost, and the food is infused with a lovely flavor. 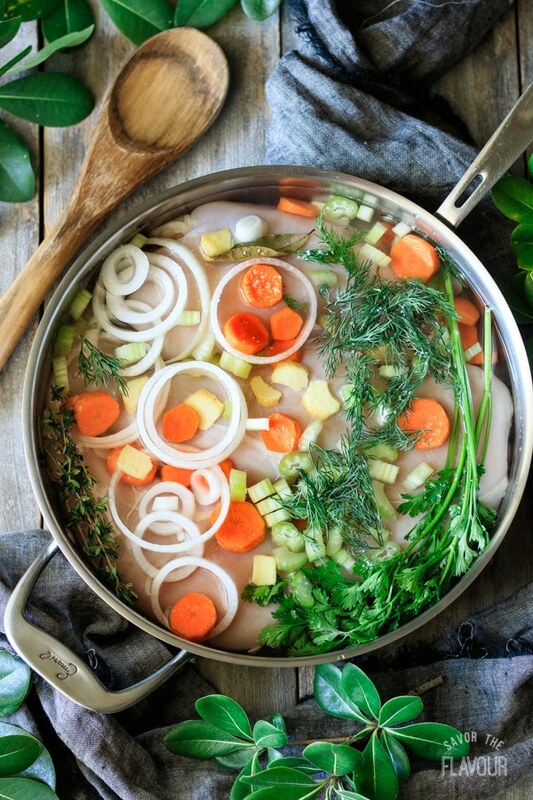 Since no fat is used, poaching chicken is a healthy alternative to pan or deep frying. How long should it take to poach chicken breasts? A large chicken breast will simmer in the poaching liquid for 15 to 20 minutes. You can cut that time in half for chicken tenders. It all depends upon the density and thickness of the breast. What are the most common poaching liquids? Water, stock and milk are the most popular for savory foods. Most chefs chose water and stock to poach their chicken. Milk is popular to use with fish. 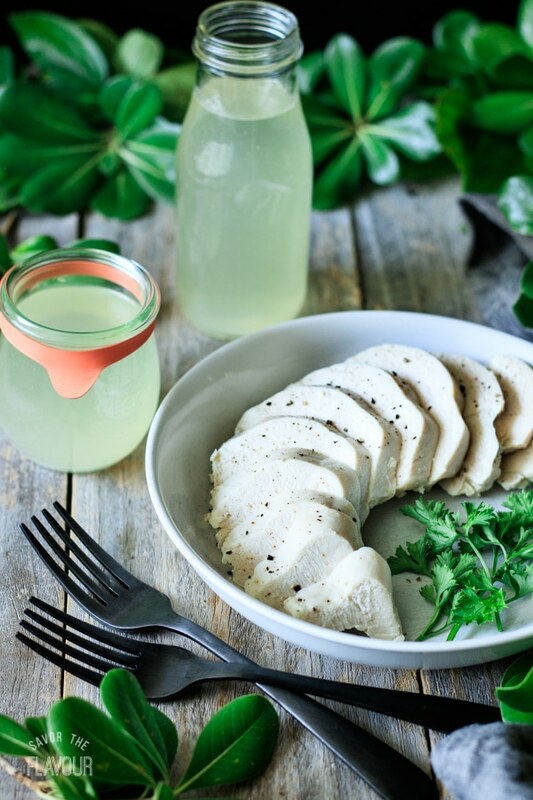 How can you prevent poached chicken from becoming tough? 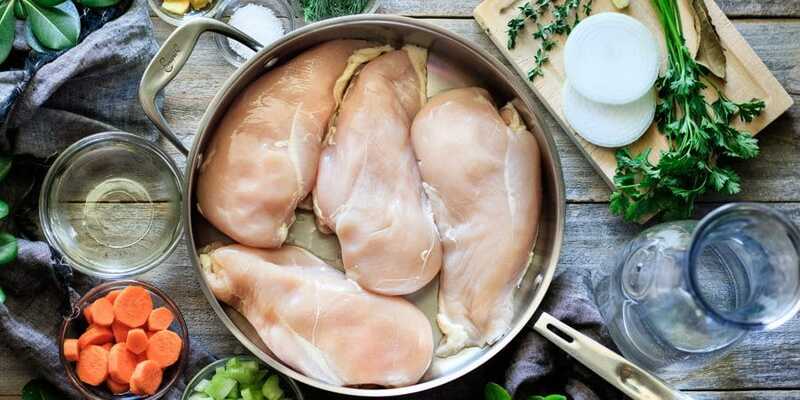 The secret to silky, tender chicken breasts is to start the chicken in cold water, bring to a simmer, and cook over low heat. Which type of chicken is better to poach: skinless, boneless or skin on, bone-in? It all depends what your needs are. If you are trying to reduce kitchen time, it is more convenient to use skinless, boneless chicken. If you are wanting the most flavorful and moist meat use skin on, bone-in. How much meat will one large skinless boneless chicken breast yield? You will get 1 1/2 cups of cubed chicken breast. This information is helpful when you need to scale a recipe up or down. How do you poach chicken breasts? Start by prepping all the ingredients. Cover the chicken with cold water and place the aromatics and spices on top. Bring the poaching liquid to a simmer over medium high heat. You’ll start to see bubbles at the edges. Lower the heat and let it simmer for 15 to 20 minutes, until the chicken registers 160F on a meat thermometer, or the juices run clear when cut at the thickest part. Skim the foam off the top. Remove the chicken from the skillet, then pour the chicken broth into a strainer. Make sure to put a pot or bowl underneath to catch the chicken broth. Discard the aromatics. 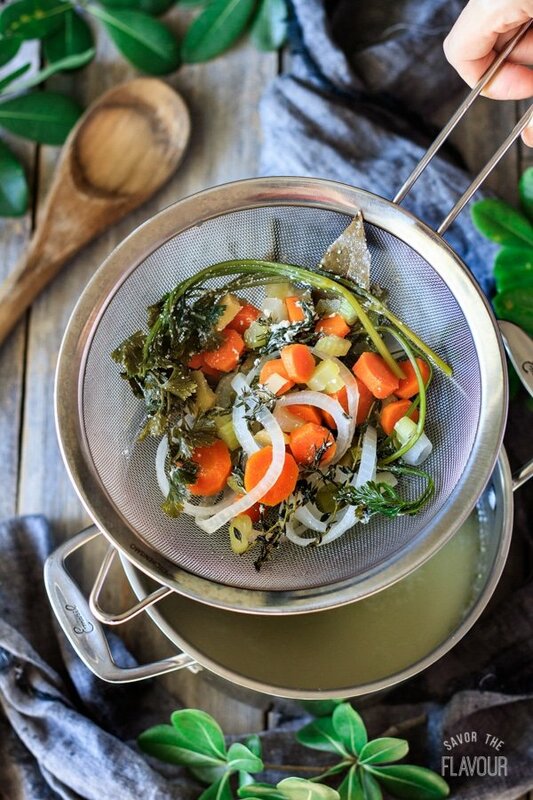 If necessary, use a spoon to remove any stay thyme leaves from the broth. Put the chicken back into the broth and allow to cool. If you’re poaching the chicken ahead of time, cover and place in the fridge overnight. Poached chicken is very versatile. It can be sliced, chopped, cubed, or shredded. Serve it either hot or cold. The meat keeps well in the fridge for up to three days, or in the freezer for up to three months. You can eat it as a main course sliced with a sauce or gravy pour over top, cubed in a Cobb or chicken salad, or shredded in dips, casseroles, Mexican food, or pot pies. As an added bonus, the chicken broth can be saved for your next homemade soup, or cooking rice. If you’ve never tried poaching chicken breasts before, I encourage you to try this cooking technique. Pass over the rotisserie chicken and poach it instead! Your tummy won’t be hungry after eating one of these hearty chicken dinners! 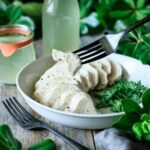 Chicken and Dumplings from Scratch: delight your family with a bowl of flavorful broth, chewy dumplings, and silky chicken. 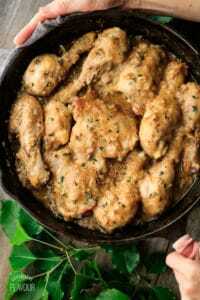 Southern Smothered Chicken: a rich gravy smothers this ultra-moist chicken–and it’s all cooked in a skillet. 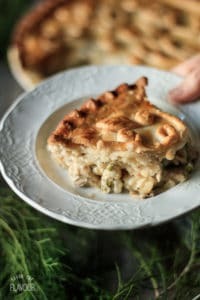 Creamy Chicken and Mushroom Pie: a classic British pie with a creamy gravy and homemade pastry top. Did you love your poached chicken? Share how you enjoyed it by leaving a recipe rating below. Rinse the chicken breasts and lay them in a single layer in a large skillet. Cover the chicken 3/4 way with cold water. Thinly slice the onions and separate into rings, then chop the celery, cut the carrots, and slice the ginger into coins. Place the onion, celery, carrot, ginger, wine, and spices on top of the chicken breasts. Cover and bring to a simmer over medium high heat. You will notice bubbles forming at the edges of the skillet. Be sure not to let it boil, as the extra heat will make the chicken tough. Reduce the heat to medium low, keep the skillet covered, and simmer for 15 to 20 minutes (for large chicken breasts) or 8 to 10 minutes (for chicken tenders). The chicken is done when it reaches an internal temperature of 160 F at the thickest part, or when the juices run clear when cut in half and is no longer pink. Skim the foam off the surface. Remove the chicken from the skillet and place in a container with sides. 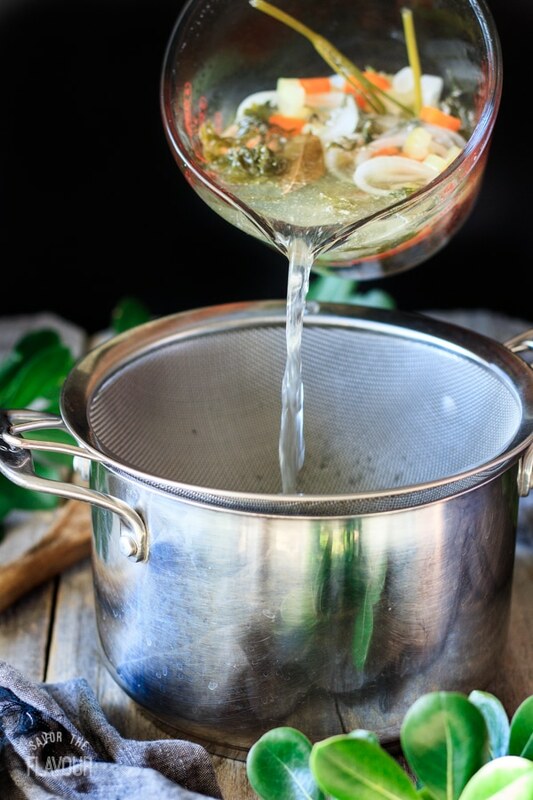 Strain the aromatics and spices from the chicken broth using a sieve placed over a bowl or small pot. Pour the broth over top of the chicken breasts and let the chicken cool in the broth. This will help the chicken soak up more flavor and be more moist. Keep the chicken broth to use for soups or cooking rice. 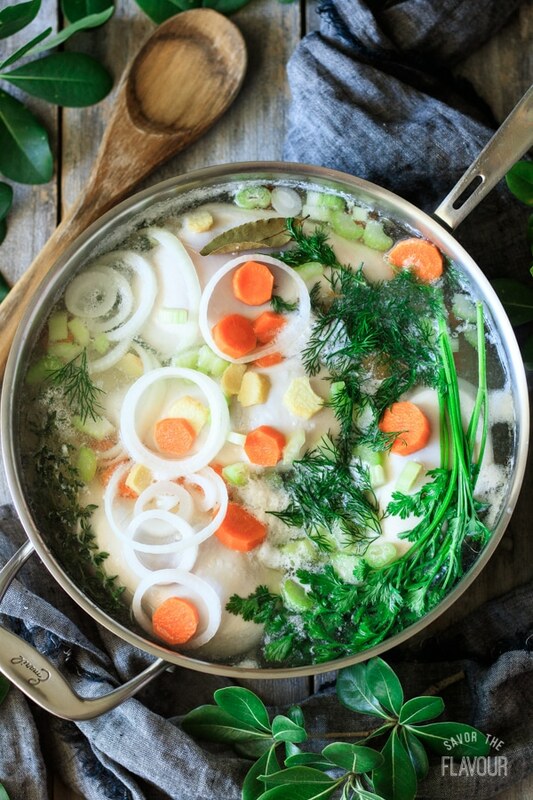 Once the chicken has cooled completely, remove it from the broth and place on a cutting board and cut as desired. Make sure to slice it across the grain. Serve the chicken cold or hot. 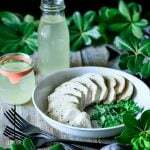 Poached chicken tastes lovely in chicken salad, Cobb salad, sandwiches, wraps, dips, pot pies, casseroles, or simply sliced and smothered with gravy. 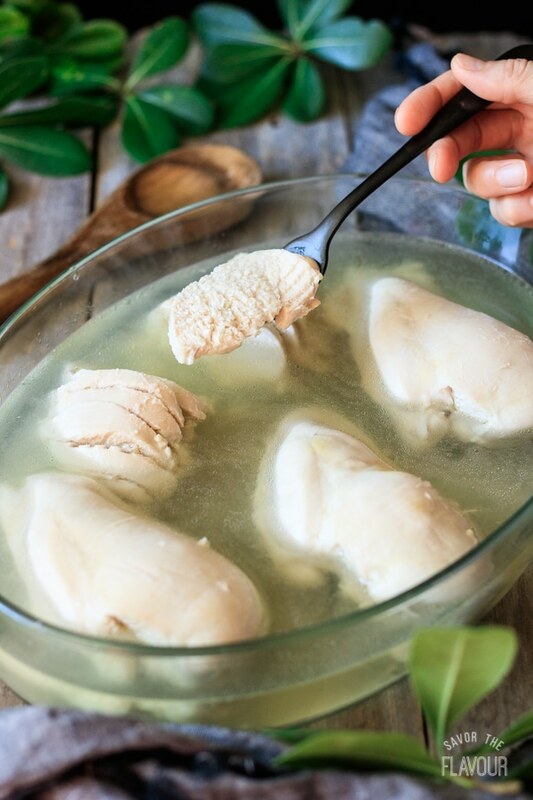 Poached chicken can be cooked two days ahead. Just keep it in the chicken broth to keep it moist and to make it even more flavorful. Poached chicken also freezes well. For ease, just cube, chop, slice, or shred the chicken before placing it in a freezer bag.